Miguel Almiron will be unveiled to the media by Newcastle United today. 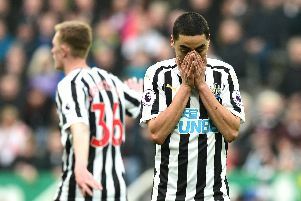 Almiron, signed from Atlanta United last week in a club-record deal which could rise to £21million, trained with his new team-mates for the first time yesterday. The 24-year-old – who last played a competitive game on December 8 – likely to be included in Rafa Benitez's squad for Monday night's game against Wolverhampton Wanderers. Almiron, if he comes through the next few days training, is expected to be named on the bench at Molineux. The Paraguay international – who had to travel to Paris to get a work permit after signing a five-and-a-half year deal at St James's Park – will be presented to the media this afternoon by the club, which also signed Antonio Barreca from Monaco on deadline day. Benitez, United's manager, will speak to the media tomorrow ahead of the Wolves game.